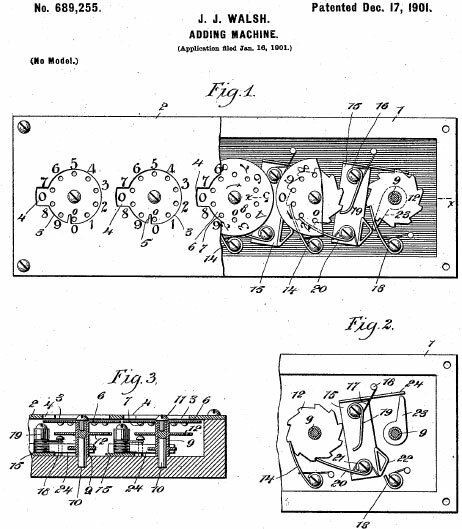 In 1901 James J. Walsh (1863-1942) from Elizabeth, New Jersey, took out the US patent №689255 for an adding machine, type dial adder, which will became popular later as Calcumeter. This stylus-driven cogged wheel adder was manufactured from 1901 by the company Morse & Walsh Co., Trenton NJ, (a property of James Walsh and Herbert North Morse, Walsh was the inventor and Morse apparently managed the business), later Herbert North Morse Co. The device was sold with remarkable market success (the basic model cost only about one-tenth the price of Comptometer or Burroughs), prospered for a while and then disappeared by 1920 (before its demise, more than 100000 adders may have been made), facing the competition of similar, but cheaper adders like Lightning , and full size calculating machines. There are variants of the machine with 5 to 12 dials (columns) for a wide variety of currencies. A 5-dial machine was $10. Each additional dial cost $5, so the 12-dial machine was $45. In 1907 are manufactured 48 models and sizes. 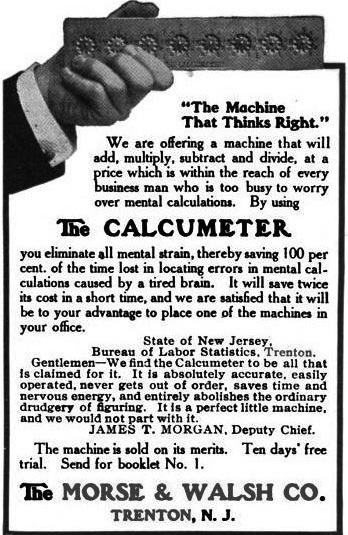 According to the advertisement in 1913 the machine has 100000 users. At some point (around 1910), a reset dial was added (patented again by Walsh, US patent №897688 from 1908), and the machine was sold as the Standard Desk Calcumeter. It was a brass and German silver made device, with measurements (for 5-dial adder): 1.8 cm x 16.3 cm x 5 cm. An interesting feature of Calcumeter is so called stored-energy carry, which is not common on small adders. The stored-energy carry in a sense winds a spring as a given dial is turned. When the dial is turned to position 9, the spring is fully compressed. When the dial is turned one more position to 0, then the spring is released causing it to add one to the position to the left. With a long carry, the carries will ripple across to the left one after another without a great deal of effort on the part of the user other than inputting the single unit on one dial.